Palay Display has a variety of bullnose shelving to choose from. 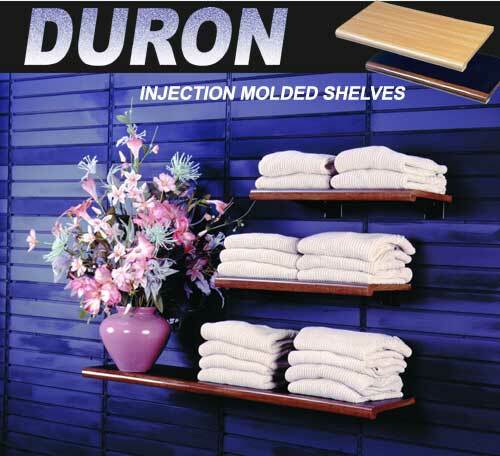 DURON - Injection Molded Bullnose Shelving...An answer to high priced display shelving. These retail bullnose shelves have a 1 1/2" bullnose shelving design which creates a rich and attractive display. Our bullnose shelving is engineered to be strong and durable yet lightweight. These bullnose shelves can not chip as the color is impregnated throughout. The bullnose shelving accepts slatwall, gridwall or slotted standard brackets. Our knowledgeable store fixtures representatives can assist you with your bullnose shelving questions. Palay Display has been supplying store fixtures and retail displays since 1945! We stock a variety of bullnose shelving. Many retailers need bullnose shelving to display a multitude of items. Our displays are great for showing off products. Bullnose shelving is an inexpensive way to use wall space. Palay Display has sold store displays since 1945. Our bullnose shelving is the best in the industry. The chip resistant bullnose shelf holds up over time. A bullnose shelf is the same thing as bullnose shelving. Slatwall is a great way to utilize these displays. The bullnose shelving lasts a long time. Try using our White Bullnose Shelving - 48"L on your white slatwall. This display store is the best online. We have many items. The bullnose shelving is finely made for long use. You can obtain bullnose shelving from this website. Palay Display carries this item. The product of bullnose shelving is yours for less!